.. This summer, Chef Michelle Forbes and the rest of The Beaufort Street Merchant + Trustee Bar & Bistro team will be getting their Spanish on .. I do enjoy a newbie. We are entirely spoilt for choice in Perth these days. It is literally every other week that somewhere new is swinging open its doors. The latest addition is Enrique’s School for to Bullfighting. It officially opened on October 11th and is scheduled to stay in the neighbourhood until mid February 2013. A pop up venue 🙂 Enrique’s is the latest installment from Team Taylor, that put together Beaufort Street Merchant and more recently the Trustee Bar and Bistro at Brookfield Place – an impressive resume. For 20 weeks, Enrique’s will be pumping out fun and flavoursome Iberian fare, cocktails, vino… and fairy floss, of course. I was most excited about visiting Enrique’s and wanting to beat the rush planned to arrive early for dinner on a Thursday. Bookings via email only for tables of 6 or more, checked daily at 3pm, for tables of less than 6, YES, we can fit you in, just rock up. I just love what they have done with the space! 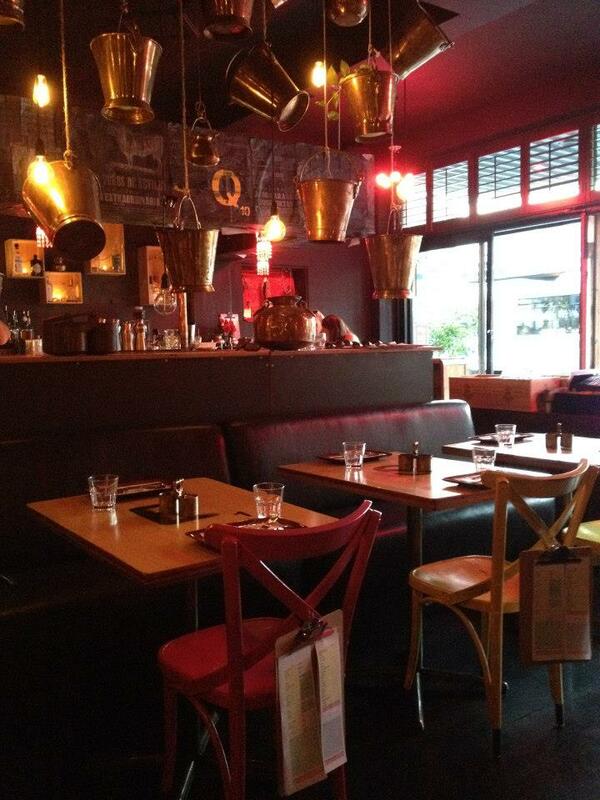 A bar to your right and seating on the left, Enrique’s has a bit of a saloon feel to it. 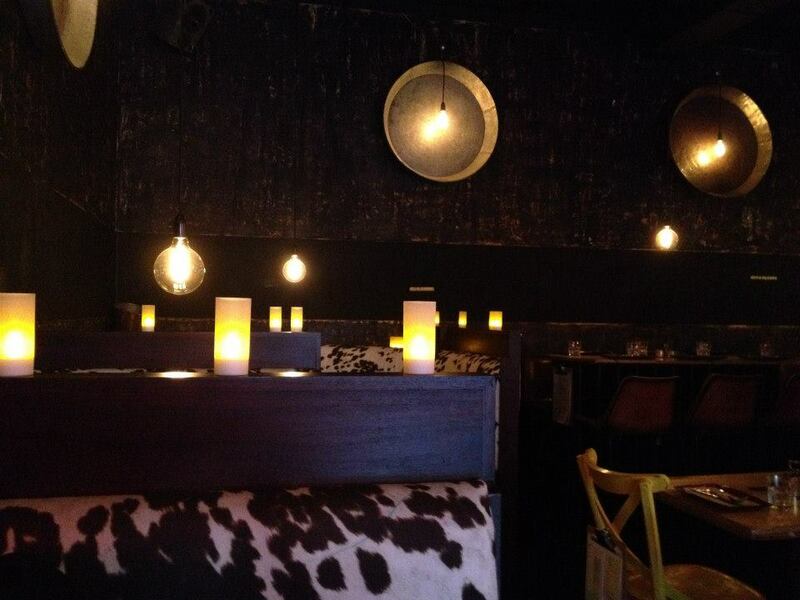 Cow print booth seating, an eclectic collection of brass jugs as a feature display and the must have feature of every new venue this year, filament lighting. 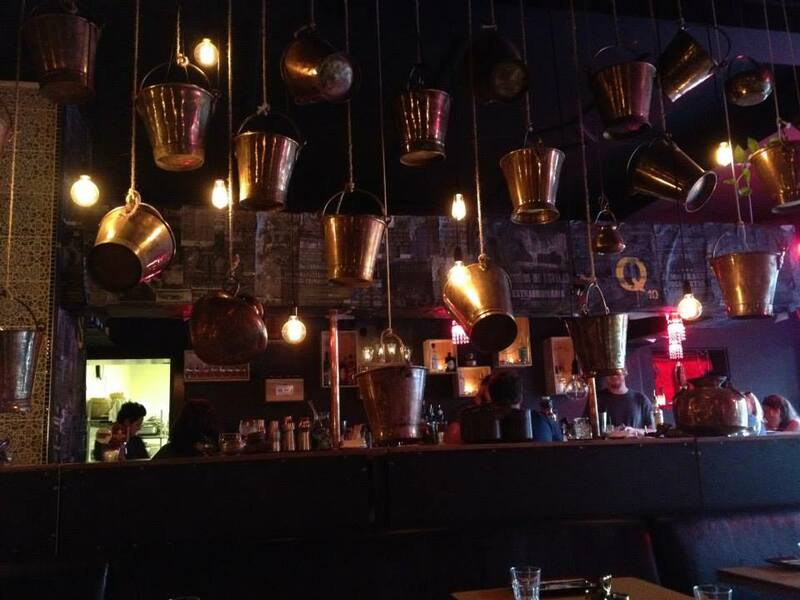 The walls were painted black in a fairly rustic fashion and adorned with large paella pans, which was in keeping with the Spanish flavour of Enrique’s and added to the funky feel of the place. And then there was the music. They had such fabulous tunes playing! Perhaps a reflection of my vintage but I found myself humming….. ok singing along to the majority of long loved tunes from the 80’s and 90’s. The place had a really great vibe. Our first order of business was sussing out the drinks list. While there was an impressive line up of cocktail options we stuck to wine, with GG opting for a glass of red and I decided to mix things up slightly with a bubbly glass of cava. 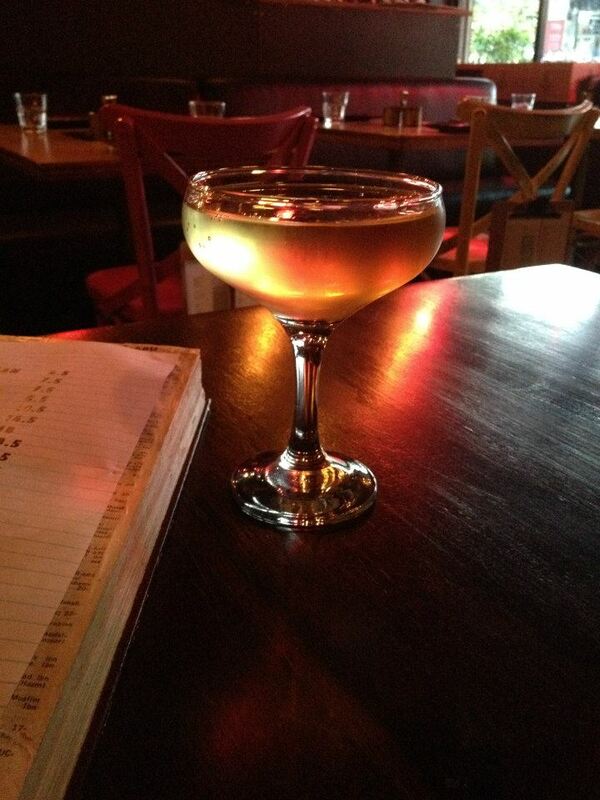 I really enjoyed that the cava came in a coupe instead of a flute. It felt a little bit fancy and the drink itself was a lovely drop. On the food front, the menu came served in a rather thick book but it was only actually the first page that had the food options printed. It was fairly brief and entirely minimal on the description front. Bit of a mystery really. So we asked our friendly waitress how many dishes she would suggest that we order. She confirmed that everything was designed for sharing and suggested 4 dishes would likely be enough. She also noted that the chips were a tasty option, though did mention they were slightly different to what you might expect. So keeping the mystery alive and deciding we were particularly peckish we locked in 5 dishes. The dishes arrived as they were ready and up first were the chips. 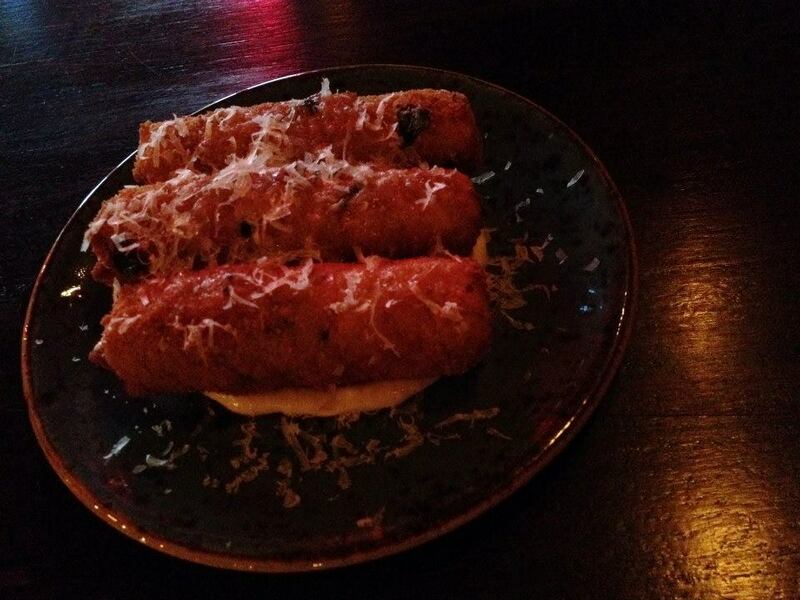 Each dish was explained in detail when they were presented. I’ll admit that I was very surprised at these ‘chips’. 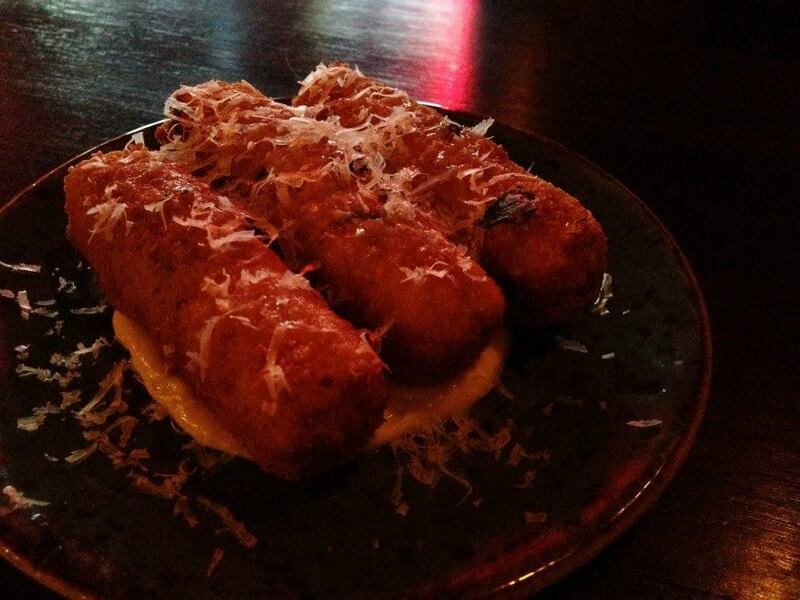 They seemed more like a croquette to me with their crumbed exterior, but from what we were told they were made of some pretty carefully prepared potato and came served on a manchego puree, a dash of truffle oil and a grating of more manchego cheese. Yes, they were tasty. Yes, they were something different. But would I have preferred something a little more standard and a little more generous in size, I’d probably say yes. My pin up chips for the year had been the Fattie Chips with Truffle Aioli at Laneway Lounge and they were only $9 and these three fancy fingers at Enrique’s were nice but give me the Laneway chips any day. So initial impressions were that Enrique’s had tasty cuisine, but serving sizes were on the smaller side. But hey, we had another 4 dishes on the way. Two of them arrived in quick succession, the ceviche and the occy & chorizo. The ceviche was white fish cubes with blood orange sorbet, delicate julienne of apple pieces and a generous infusion of lime. 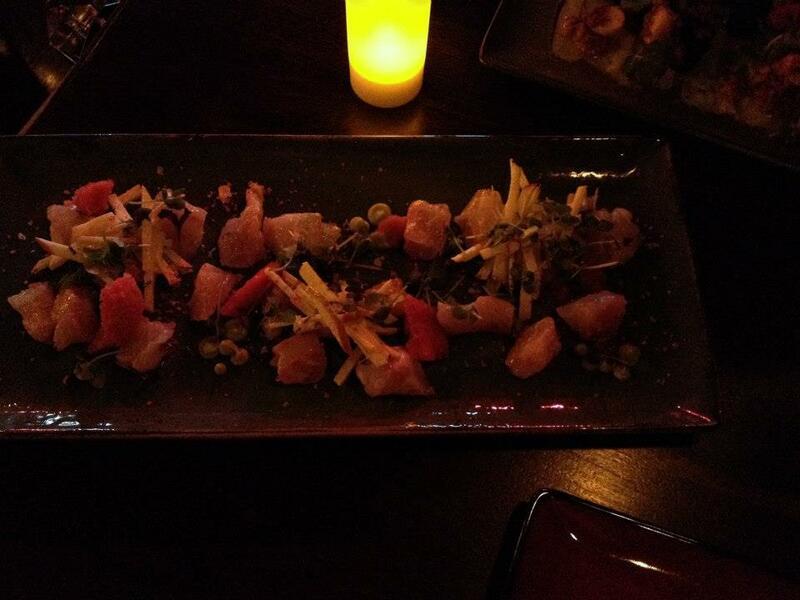 The flavor of the ceviche’d fish pieces was divine! A delicious and well balanced combination of zingy lime and sea salt. It was so well matched with the refreshing chill from the blood orange sorbet and the textural contrast from the lovely sweet apple fingers. The main issue we had with this dish was that some of the fish pieces were quite chewy, which somewhat diminished the magic of this dish for us. 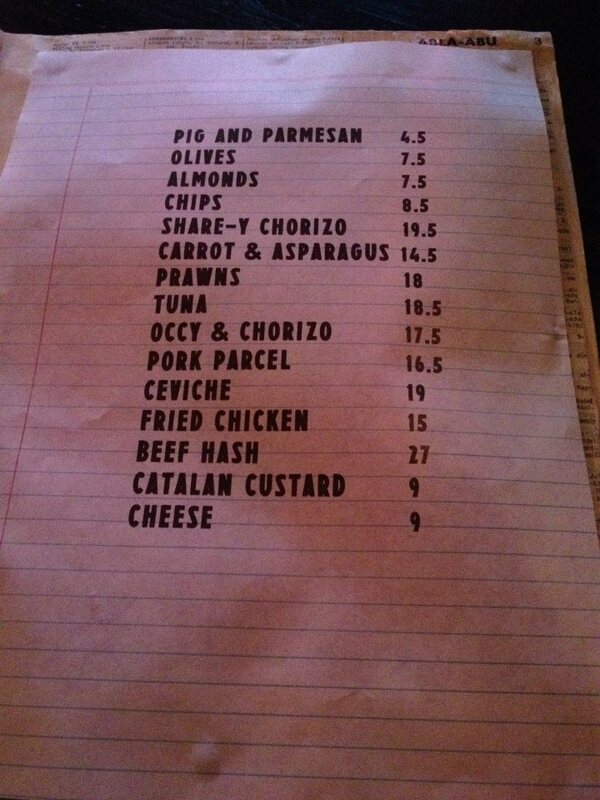 Moving on to the occy & chorizo, it was another one with a definite creative slant on what the menu suggested. On the bottom of the plate was a thin sliver of an octopus terrine, topped with chunky sous vide pieces of octopus along with some black olives. I happily enjoyed a piece of octopus, which did just melt in the mouth, before it occurred to both GG and I that we couldn’t find the chorizo. So as a waitress walked past we asked whether it had been forgotten. 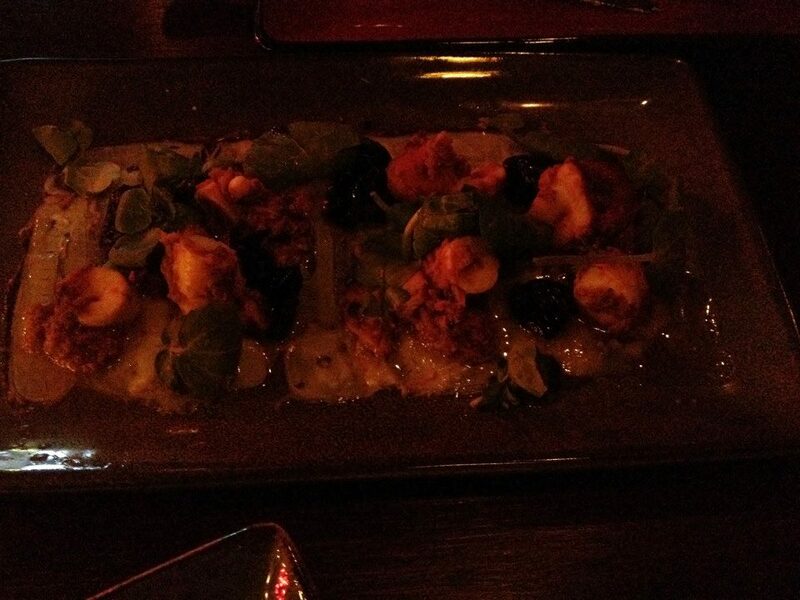 As we found out (and must have missed in the dish description) the octopus has been coated in a chorizo paste. Hmmm…. interesting, but I would kind have preferred some actual pieces of chorizo. Perhaps I’m getting too hung up on the literal with what I order these days 🙂 For an octopus dish I did like it though. Our final foray into the seafood scene was the prawns. 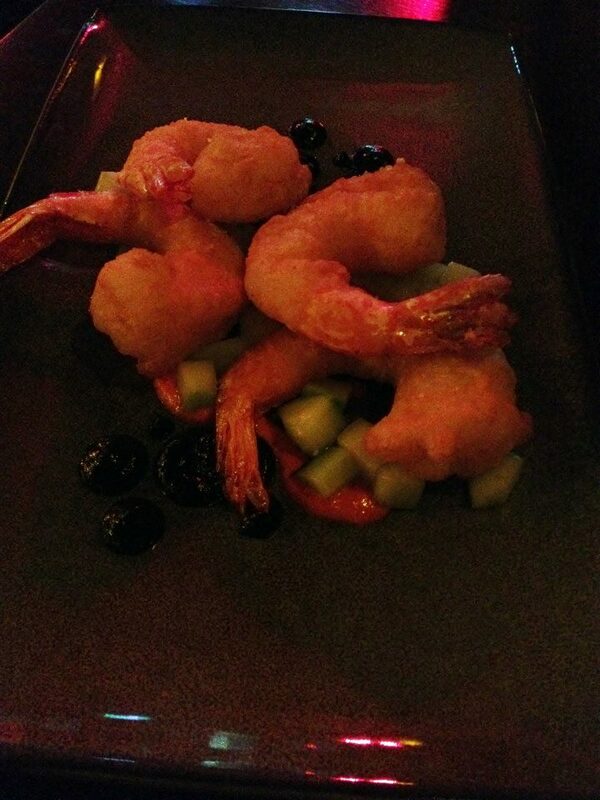 Four plump prawns had been lightly battered and served with cubed cucumber and some artistic dots of squid ink and a chilli sauce. Really couldn’t fault Enrique’s on the presentation front. All very polished. The prawns were really good, not much flavour from the squid ink but the chilli sauce packed some punch but was well countered by the cooling cucumber. Of the three ocean inspired dishes I would say this one was my favourite. 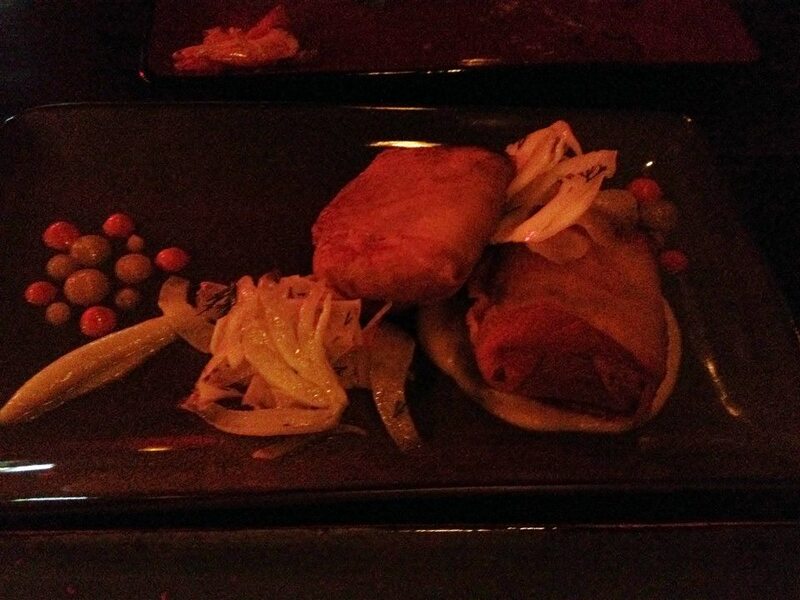 Finally it was time for pork and two parcels of slow roasted pork shoulder encased in crispy brik pastry arrived on top of jeruselum artichoke puree, with a side of fennel salad. I enjoy pork and this meat just melted from the slow cooking attention it had received. Fennel has become a massive favourite of mine this year and I enjoyed that it was included in this dish. So we’d partaken in five dishes at Enrique’s. And while there’d been a few highlights, I have to say that our primary issue was that when we left we were both still a bit hungry. I loved the fit out and the vibe of the place, the service had been really friendly and the food was nice but there just wasn’t enough of it in my opinion. Drool slurp drool and then slurp some more.